Geetha Ramaswami is a Research Associate at NCF, and is particularly interested in invasive plants—especially how they affect and get affected by the ecosystem they invade. What are introduced species? What are native species? Well, over many millennia, different species have evolved to live in different kinds of environments. They may not have had the chance to reach new environments and are therefore not found there ‘naturally’. Say, you are a hypothetical little frog sitting on an island 1000 km from any continent, in the middle of a sea; and say, your skin cannot tolerate swimming in a salty sea, you wouldn’t really risk trying to cross an ocean just to reach a new place. But you are well equipped to deal with the highs and lows of life on the island itself. You would be a ‘native species’ on that island. But suppose you catch the fancy of a pet trader, who thinks that your brilliant colours belong in a mainland aquarium. He captures a bunch of you and ships them across the ocean onto a continent (where neither you, nor your ancestors of many generations have ever set foot before), you would be an introduced species on the continent. What exactly is an invasive species? Supposing a bunch of you grew too big for your aquarium on the continent and the pet trader decided to release you into a shiny new pond outside; you found a whole buffet of new insects to eat, thrived, survived, managed to reproduce and spread from your point of introduction to really far (say a 1000 km inland), and perhaps even started affecting other species and the environment there, you would be called an invasive species. How can a puny thing like you have achieved such a gargantuan task, you ask? Perhaps your brightly coloured skin exudes toxic stuff that predatory birds are wary of eating. You don’t get eaten as much as the local frogs. The more you stay alive, the more you can breed, the more of you there are. Frog 1, predator 0. Because the local viruses, bacteria and other critters have never seen the likes of you before, they do not know how to use you as a host, you might escape getting a fatal infection from local frogs. Frog 1, parasite 0. Perhaps hundreds of you escaped into a world with only tens of other kinds of frogs. The locals’ small numbers are no match for the hundreds of you now eating and breeding on their land. Perhaps you are better at catching insects; perhaps you can take the cold or the heat better. The locals, fighting disease, predators and the weather while trying to feed and breed stand no chance against you. Frogs 1, competitors 0. Meanwhile, your eggs float around in seasonal streams, spreading to new areas as the water flows. You see, invasive species have many tricks up their sleeves to ensure their own survival and persistence. It does seem like it’s way easier for species to spread to new locations today than ever before, doesn’t it? What is encouraging this further spread? Humans! Creatures can now traverse millions of kilometres over land and water in a jiffy, riding in human-made means of transport, a feat that would have perhaps taken a species many millennia to achieve without man being around. A lot of this transport is driven by some human-created need for the species in a new place (for example; exotic pet trade; biocontrol agents) or by accident (for example; the introduction of mammals like rats on an island without mammals, which came as stowaways on a ship with the humans who colonised that island). What exactly are invasive plants? 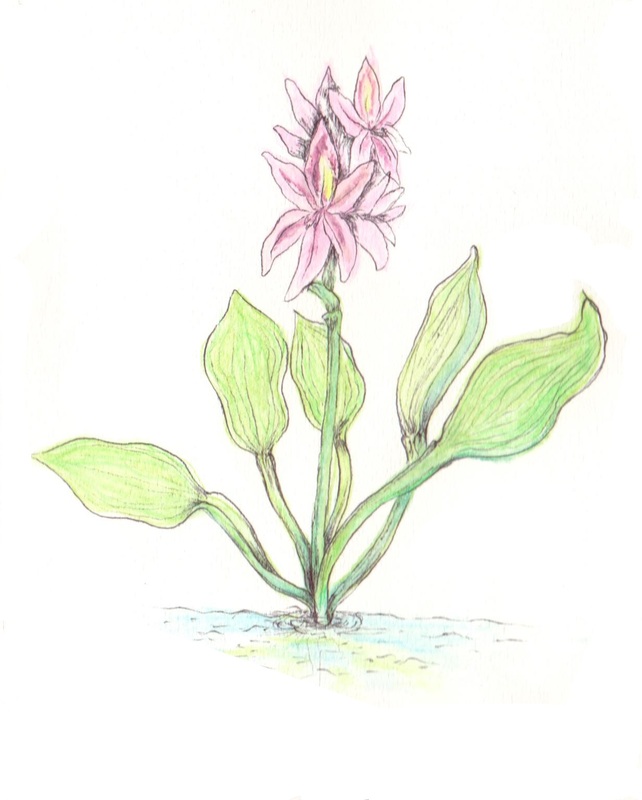 What makes a plant invasive? Imagine all of the above happened to you, except you are not a frog, you are a plant! Many plants are introduced to new places either intentionally for human benefit (they had pretty flowers and looked nice in a garden; they were fast growing and rapidly provided fuel and fodder) or accidentally (a bunch of invasive plant seeds got mixed with seeds of a crop plant and got exported to a new place). If they ‘escape’, survive, establish a population, proliferate and spread thereon, they can be called ‘invasive’. Resistance to attacks by plant-eaters and microbes, producing biochemical arsenal that can harm other plants, hijacking helpful fungi to do your bidding, producing lots and lots of seeds, having the ability to exploit resources and to withstand local conditions, having the ability to change local conditions—any combination of these superpowers can make a plant invasive. Lantana, a thorny shrub with pretty flowers; the water hyacinth, an aquatic plant with leathery leaves that covers entire lakes; Parthenium, a small plant with white, acrid-smelling, asthma-inducing flowers; are all invasive plants commonly seen in and around Bengaluru. So, all invasive species are introduced species, but not all introduced species are invasives, right? That’s correct. Many introduced species may not fare as well as the hypothetical frog species mentioned earlier. They might quickly die out in an environment that they have never encountered before. Or they may not be able to compete or breed or move very far and be smothered by their own brethren. They may not find essential partners—mutualists—required for breeding and sustaining their numbers. Say, you are an introduced plant that produces flowers that only hummingbirds can pollinate, and you are now stuck in a new place without any hummingbirds—you will never get pollinated, your seeds would never set and your lineage will end with your death. You will not be able to spread and therefore you will not become invasive. Are all non-native, introduced species harmful to the environment, do all of them negatively affect biodiversity? As I said before, not all non-native species will become invasive. Those that do, are often associated with some or the other effect on the new regions that they colonise. ­Invasive animals can sometimes directly decrease the diversity of other animals and plants that they could be feeding on. Have you heard of the brown tree snake? It is native to Australia and Papua New Guinea and was accidentally transported to Guam. The subsequent invasion was devastating for prey species like birds, rodents and reptiles. Some birds even went extinct on Guam! It is a bit more complicated in the case of plants. If you look up scientific literature, you would find that many invasive plants are associated with reduced native plant diversity. But that may not always be the case, because the direction of the effect (reduced diversity due to invasion or invasion due to reduced diversity) is not always clear. Add to it the complications of a natural system—the soil, weather, water, animals, microbes and human interference, and you have a confusing cocktail of factors which could all affect native species diversity in more ways than the invasive species by itself. Needless to say there are many conflicting opinions amongst the scientists who study invasive plants. Researchers do a kind of statistical analysis called ‘meta-analysis’ to compile and summarise results from many many studies in one place. By looking at these meta-analyses, one can say that the environment, the scale at which observations are made, the time and place of observation all affect the impacts that invasive plants have on native diversity. Some of the more worrisome effects of invasive plants (apart from reduced native species diversity) are: changing existing ecosystem processes that have been shaped in space by time (like fire cycles, soil nutrient cycles, local hydrology), changing existing relationships between native species (like hijacking helpful fungi or pollinators or seed dispersers), and releasing ‘allelopathic chemicals’ that can reduce native species survival and growth. Can some native birds and animals actually benefit from invasive plants? They can! Especially if the invasive plant is provisioning them with lots of tasty food! Pollinators drink nectar from flowers and in return transfer pollen between plants, helping them create seeds that will become future plants. Without their courier service, many plants will be doomed! Invasive plants offer the same kind of barter as native plants (nectar in return for pollen transfer) and are readily used as an additional source of food by those native pollinators who care only about a nectar reward and not so much about where it is coming from! Some invasive plants make delicious berries that animals eat. Fruits are, of course, just bait. The real purpose is to make the animal carry the seeds in its gut far away from the parent plant (seed dispersal) and get pooped out in a new place so that the plant can spread there. So, yes, some fruit-eating animals that find invasive plant fruits tasty will use them as a food source. Some microbes (bacteria and fungi) that benefit plants in some way (say, by producing nutrients or absorbing water) and gain benefits in return (eat up carbon fixed into sugars by the process of photosynthesis), may also be happy in the company of invasive plants ready to partake in these exchange offers. That said, we need to acknowledge that invasive plants are entering a complex mishmash of relationships between native species and their environment (their Facebook relationship status might as well read ‘It’s complicated’). What is certain is that invasive plants bring about change and some of these changes are so dramatic that a pre-invasion state may never be achievable. But to naively classify all changes as simply ‘good’ or ‘bad’ does not help in addressing problems holistically. ‘Good’ and ‘bad’ are dependent on the context in which the plant is being looked at (e.g. : ‘bad’ for native plant diversity, but ‘good’ for the populations of pollinators dependent on the invasive plant). Also remember that change happens over time; ‘bad’ today may set off a chain reaction of other processes that may result in something ‘good’ ten years from now and which may revert to ‘bad’ in another ten years. That does sound like a very complicated relationship, indeed. Tell us a little about what you have been working on. I work on the ecology of a fascinating invasive plant called Lantana camara and all the mischief it is bringing about on the forest ecosystems in India. Lantana is a plant of central and South American origin and is a very common invasive plant in India. You might have seen this thorny, messy-looking bush, lush green in the monsoon and skeletal in the summer. It has pink or orange flowers held in little bunches and the leaves have a distinct sweaty smell when crushed. 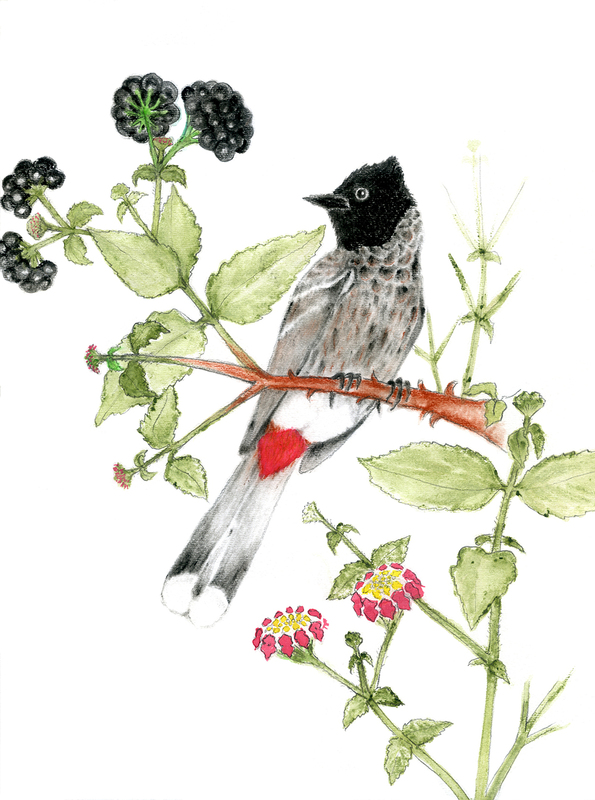 You might have eaten its berries too—small, purple-black, sweet, with a single grape-like seed inside. Lantana has many survival tactics—it shades out competition (but does not like being shaded out), is fire and abrasion resistant, it can live in very hot and moderately cold and moderately dry habitats, it produces a lot of flowers and a lot of seeds and invests heavily in a seed bank. Once a substantial population has established, Lantana is very difficult to get rid of and is impossible to completely remove or ‘eradicate’ because of these tactics. I spoke about seed dispersal earlier. 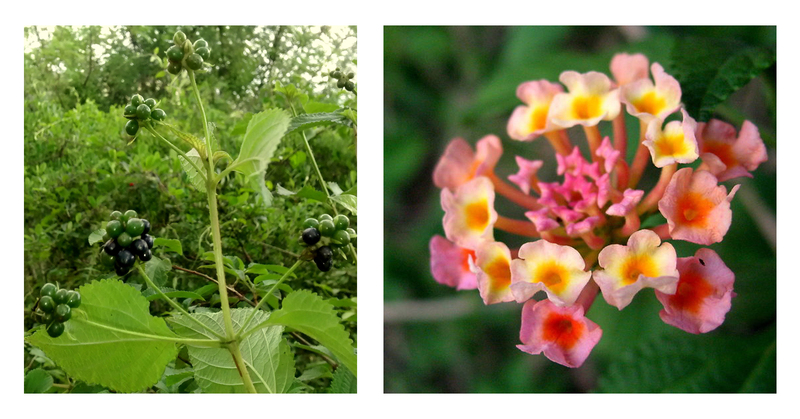 My current research looks at whether lantana is stealing away dispersers from native species. I want to understand if birds like eating lantana berries more than the fruits of other native plants, and if so, is it because the fruits are of better quality, or because they were available when others were not, or because there is way more lantana fruits than any other kind of fruit when everyone is fruiting? Perhaps lantana does not steal dispersers, but in fact, lures more dispersers to a native plant that it is sitting next to! I hope to unravel some of these mysteries by next year. Lantana was introduced into India as an ornamental garden plant by the British in the early 1800s. Legend has it that a few rogue plants escaped from the Calcutta Botanical Gardens more than 200 years ago and the descendants of those plants continue to terrorise farmers and forest managers alike, ever-growing in The Blob-like fashion, engulfing larger and larger swathes of land with each passing year. Lantana was also introduced along the west coast of India and some populations may have even spread to India from Sri Lanka. Even as early as the late 1800s, reports of lantana taking over hillsides and plantations were being published in the esteemed forestry journal of that time—the Indian Forester. And here we are 200 years later, still devising ways to deal with the same plant! What is being done to keep invasives out? It is better to nip a problem at the bud by preventing invasives from arriving at one’s shores! Different countries have their own regulations to deal with the prevention and control of invasive species. Many countries quarantine live plant material arriving from overseas, and import is permitted only when such material is found to be free of what is considered a weed. In India, this is carried out under the Plant Quarantine Order (2003) and the Plants Fruits and Seeds Regulation of Import into India Order (1989). But these regulations are fairly recent, developed after the ill effects of weedy invasive species were recognised. The plants that came before these regulations are still around and land managers have to deal with them everyday! Inside forest habitats, the Forest Department Working Plans in different Indian states have guidelines to remove (for the purpose of eradicating or controlling further spread of) invasive plants. Often a suite of methods is used to remove invasive plants from target areas and this exercise is usually a yearly occurrence (it depends on the availability of funds and manpower). Methods of removal depend upon the species being removed and are very labour-intensive. In protected areas, beats are regularly monitored and data on the status of invasives is updated regularly. Outside of forests and protected areas, in agricultural land, tilling and seasonal burning usually keeps invasive plants in check. Can all of us help in preventing the introduction and spread of invasive species? How can we do so? Follow quarantine rules at the airport if you are travelling from abroad—declare any living thing you may have on you. Make sure that the seeds you are getting will not turn into a vile weed later. Don’t buy exotic pets! Don’t release exotic pets into the wild (fish and turtles are released in the nearest water body once no one wants them—DON’T do that! Have a look at this escaped alligator fish wreaking havoc on fish and fishing communities: http://scroll.in/latest/810463/experts-called-in-after-angler-catches-rare-alligator-fish-from-kolkata-lake). Don’t know if the pet you want is exotic and has the potential to become invasive? Check out the terrifyingly large Global Invasive Species Database (http://www.iucngisd.org/gisd/). If it’s on this database, DO NOT GET IT! If you are setting up a garden, make sure you are aware of the plants going into the garden. Read up about the plants you are putting in your backyard. Crosscheck if your plant is on the GISD database and DON’T PUT IT IN YOUR GARDEN if it features on this list. Instead choose from a list of local native species. You might want your plants to attract butterflies and birds to your garden. Ensure that such plants are native and not introduced plants. Even if you do not intend to attract pollinators and dispersers, be aware that colourful flowers will get pollinated and sweet fruit will get eaten! So, double check to make sure that your plants are native, to prevent an inadvertent escape via bird- and bat-mobiles. Read regularly about invasive species (like at this Facebook page: https://www.facebook.com/SPAIS-Spotting-Alien-Invasive-Species-914556678602142/) and militantly encourage people to follow steps 1,2,3. Report the occurrence of an invasive plant (if you can ID it) on a reliable forum like: http://indiabiodiversity.org/group/spotting_alien_invasive_species. These sites help scientists create databases on the extent of occurrence of invasive plants. DON’T remove creatures from where they belong and put them in places where they don’t. Following this simple rule will ensure that we do not have to deal with pesky invaders in the future. This was such an interesting read.waiting for more janoo. Good writing…quite true for other invasive organisms including humans..
Great Article! Have seen this plant at Kanha where it has spread alot. This is so entertaining and fun to read! Very good write-up. Perhaps it could be published somwhere. Very informative and an awesome article. Reminds me of your an “ode to lantana” pic. Keep up the good work.